Cook colocasia with required amount of water, salt, turmeric powder and tamarind. 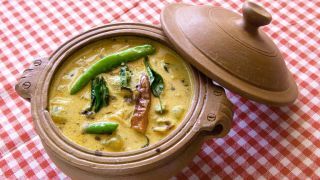 To this add fine paste of coconut, green chilies, cumin seeds, shallots and curry leaves. It should be of thick consistency. Add salt and remove from the flame. Let it cool. Add the set curd to it. In another pan add oil and splutter mustard seeds. Add dried red chilies and curry leaves to it. Add this to the asthram.